Here are 10 Sneaky and Easy Ways to Get More Vegetables Into Your Life! Including my favourite recipes from soups to veggie chips! My name is Jessica and I am in love with vegetables. No really, I really do love them. I’m happy to say that especially since 2017 I have been getting in all my required veggie servings each day, and doing so happily. Now, this was not always the case. I’ve found a way to make, prepare and get more vegetables into my life in a manner that is way more exciting than just 3 cups of plain old lettuce, raw tomatoes and cut up cucumbers (roll eyes). Here are the top 10 ways that I load my days with veggies. Try new cooking styles with them – find your ideal way to love your veggies! These tips are not in any order, but I’m pretty sure that this is my #1 tip. Definitely get into the kitchen and experiment with trying your veggies in new ways. For example, do you always steam your carrots or have them raw? Try roasting them. I found that I fell in love with carrots when I started to have them roasted. Trying out a new way to appreciate them really changed it for me without completely covering the veggie itself. There are so many ways to eat veggies – steamed, boiled, roasted, sautéed, grilled, baked..the list goes on. I know many people who finally loved kale after they blanched it for the first time. You don’t just have to eat your veggies raw. Also, don’t be afraid to put seasonings on them! That’s how you’d eat your protein (not just plain) so show your veggies some love too. I love using veggies in place of my favourite carbs or even on them. 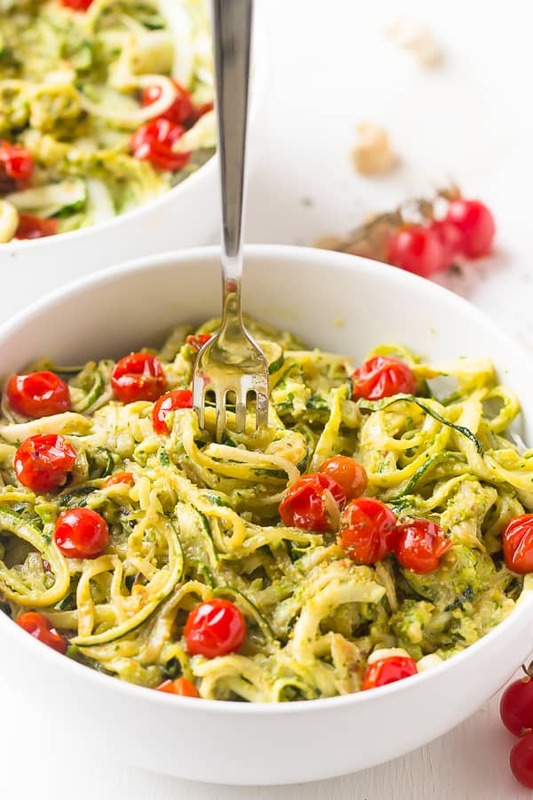 Try making zucchini noodles instead of regular pasta (which my husband swears tastes like the real deal) or making a sweet potato pizza crust or even a spinach crust instead of regular flour. It will help you to become even more creative and tends to load in LOTS of veggies into your meal. I also love loading my homemade pizzas with endless amounts of veggies – eggplants, zucchinis, bell peppers – you name it – plus a homemade pesto made of several cups of kale or basil or spinach. It’s a great way to still enjoy your meal but also load it up and get more vegetables into it. Other ways to make healthy swaps would be to use eggplant as a base for your pizza also, or cauliflower wings instead of regular wings (THESE. ARE. AMAZING). These are a total no-brainer, but something that can easily be missed over. I usually pack up to 3 cups of spinach into one smoothie, and I do not taste the raw spinach at all. One of my favourite smoothie recipes is my Tropical Green Smoothie, and I add even more spinach than called for in the recipe. Drinking your veggies is a great way to load it in! If you’re more into juicing, that’s also a brilliant way to enjoy and get more vegetables in. 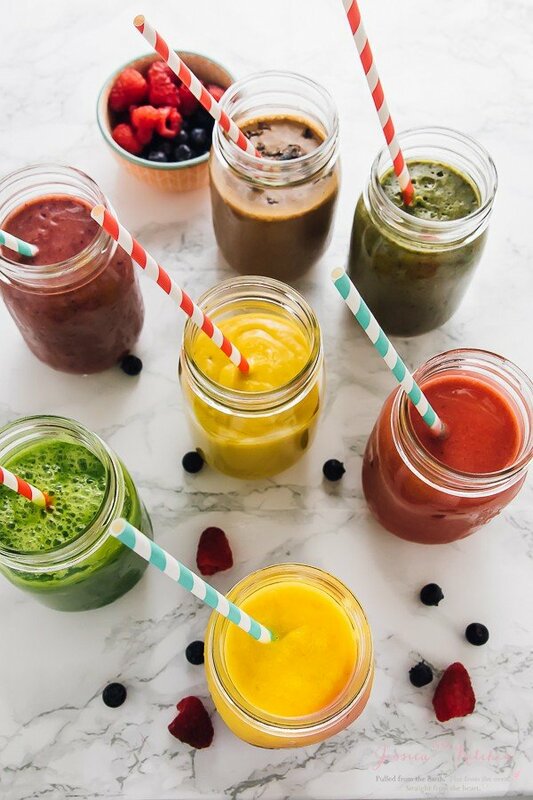 Don’t be afraid to amp up your smoothies either – a drizzle of this, a pinch of that brings it to life and helps you to look forward to it in the morning or evening. Make a soup and add all the veggies. Soups. Wow, the mother of easy sneaky ways to have more veggies. Is there any easier way to get more vegetables into your diet?? I’ve come to really love soups and their nature, and how versatile they can be. My Lentil Soup loads a lot of veggies into just one serving without even tasting it. 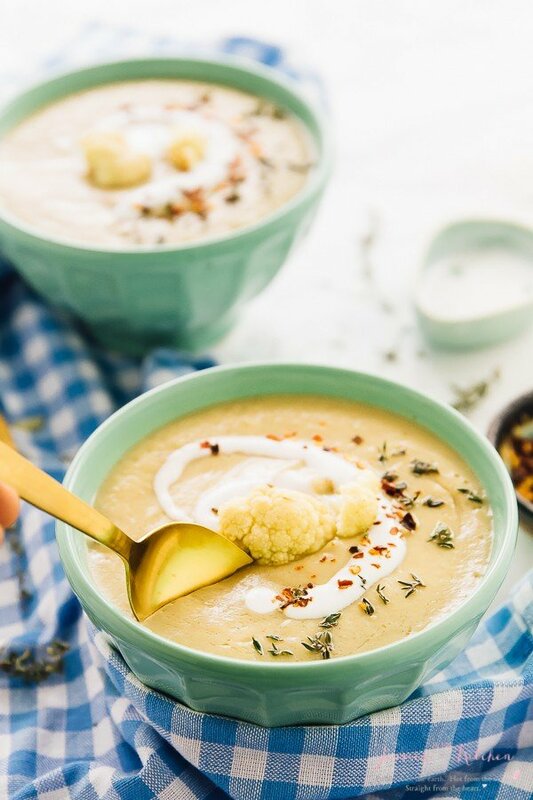 My Cauliflower Soup aka the recipe that got reviewed the quickest out of any other recipe I’ve ever made, loads a whole cauliflower into it without you tasting it at all. All you taste is delicious, roasted creaminess. 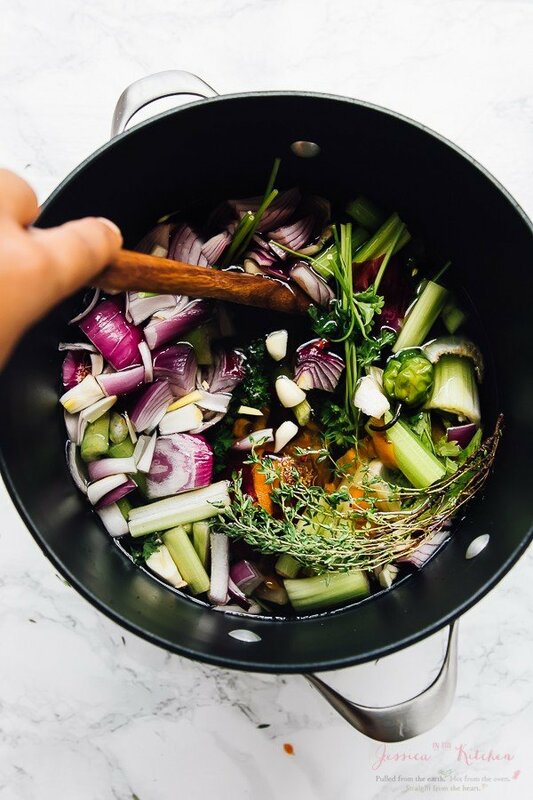 Soups definitely bring out the best in your veggies. I love this idea for using veggies, and I don’t just mean in sweet ways. Avocado is a veggie (fruit, but we are counting these here too) that you can easily bake into sweet goods for added creaminess. You can also however bake up some delicious savoury snacks using veggies. Kale chips are a brilliant example. Using fresh kale produces the crunchiest, flavourful veggie snack you’ll have. 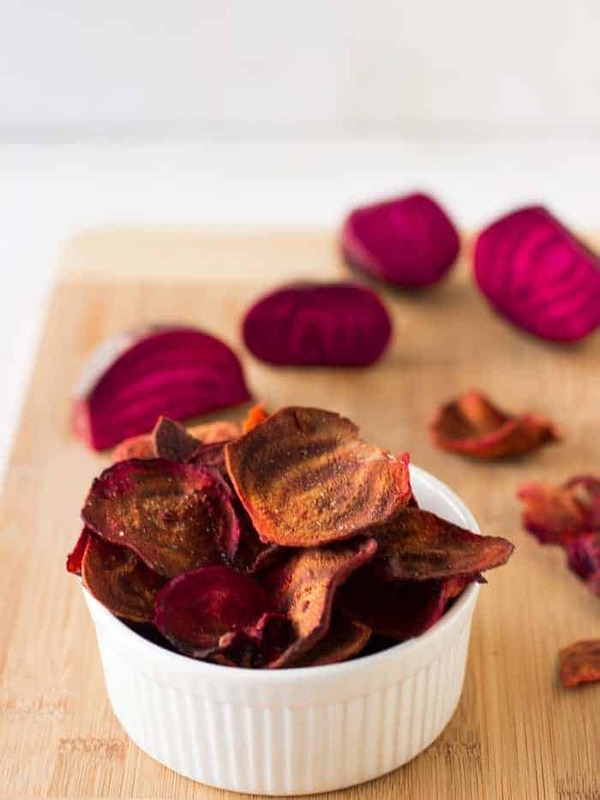 You can also make sweet potato chips, apple chips for fruits, and beet chips. These all bring out beautifully unique flavours in your veggies and are so easy to gobble up. Buddha bowls are a huge love of mine. 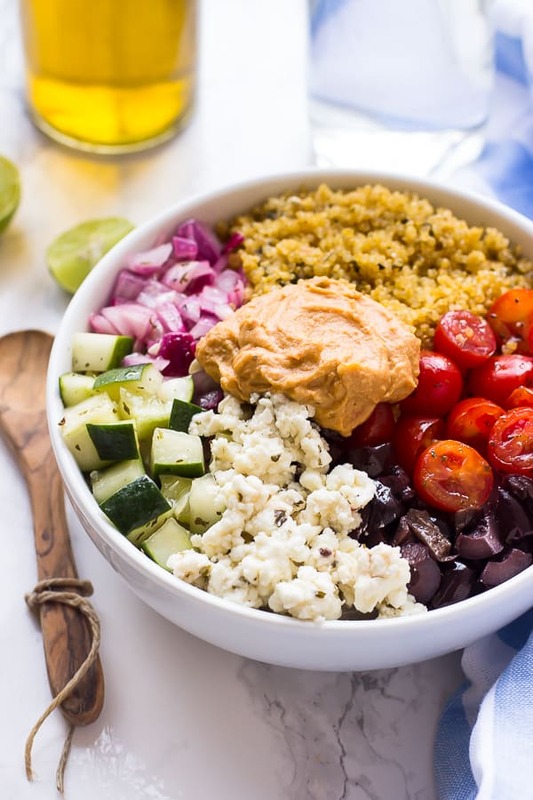 Essentially, you pile your bowl full with a variety of veggies and drizzle a sauce/dressing/thick hummus or spread on them and then eat them all. Why it works is because the combination of the different veggies almost always compliments each others. My fav buddha bowl is my Mediterranean Quinoa Salad Bowl. The tomatoes work so well with the cucumbers, the olives, and the quinoa. Every bite is filled with variety and flavour instead of just eating these veggies on their own. It provides newness, uniqueness, creativity and a surprise in each bite. It’s also a great way to (yes) pack a lot of veggies into one bowl. I love sautéing lots of spinach down for a breakfast bowl, or adding baked sweet potatoes fries on top of a dinner veggie bowl. There are so many ideas for combos that you’ll never get bored. Veggie burgers! We all love a good burger, but veggie burgers serve two great purposes by tasting delicious and also having lots of veggies in each burger. My black bean burgers are a favourite, and if you folded in 4 cups or so of spinach into the burger batter, you wouldn’t even taste it in the end. 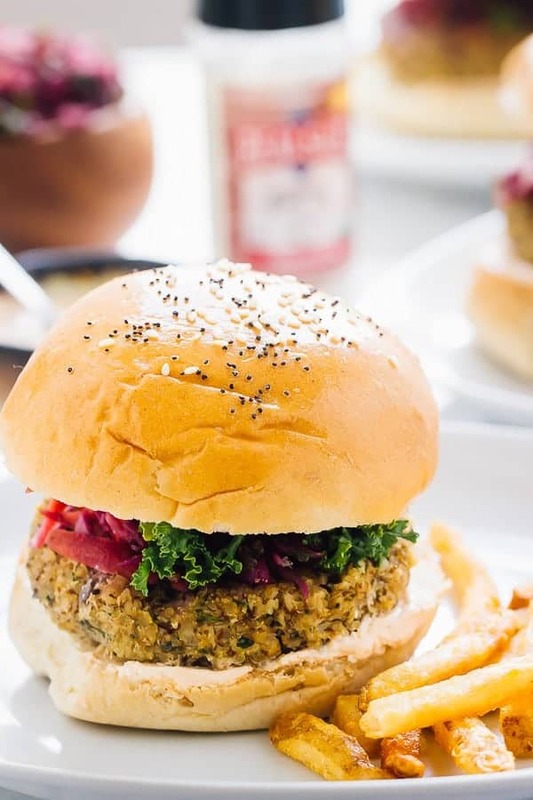 Veggie burgers literally use the combo of veggies to taste delicious so you definitely cannot go wrong here. 3-4 cups of kale = one divine kale pesto. Easy, creamy and delicious way to get more vegetables into every meal. Even better if you add roasted garlic. You can pour this pesto over the zucchini noodles mentioned earlier, by the way. Sauces are also great ways – be that a cauliflower sauce, a tomato sauce or your own concoction. This works SO well for me! When veggies are banished to the dark scary “crisper” draws I almost always find them weeks later, cringing as to what has become of their fate. I’ve been putting veggies on the top shelf and middle shelf and I am finding that not only am I getting my daily fruits in, every time I open the fridge I see a veggie and end up using it in the upcoming meal. Easy way to get more vegetables. Out of sight, out of mind definitely comes into play here. Meal prep with your veggies/Prepare a week of veggies ahead of time. Have you heard me speak endless praises on meal prep this month 10 times already? That’s because meal prep is a real time saver and is probably the easiest way to get your veggies in without noticing. There is nothing better than fresh food already made in the fridge sitting and waiting to be eaten. You would’ve already applied the above tips to your veggies be it to cook them, make them in a pesto or any other method, making your only task to be to eat them. Easy, right? 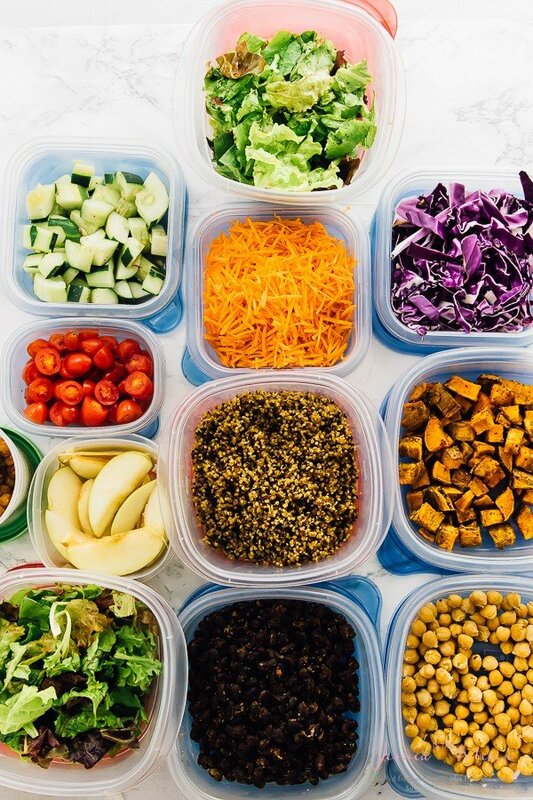 We have been meal prepping and this is definitely a large reason as to why we have been eating all our veggie servings daily. An hour or two on Sunday means delicious veggies all week, already prepped. It’ll make your buddha bowls much easier too. How do you make your veggies so that you not only enjoy them, but that you want to eat them? I would love to hear from you! If you’ve tried any of the above methods to get more vegetables into your life, please let me know in the comments section below! You have some really amazing vegetarian dishes, Jessica. 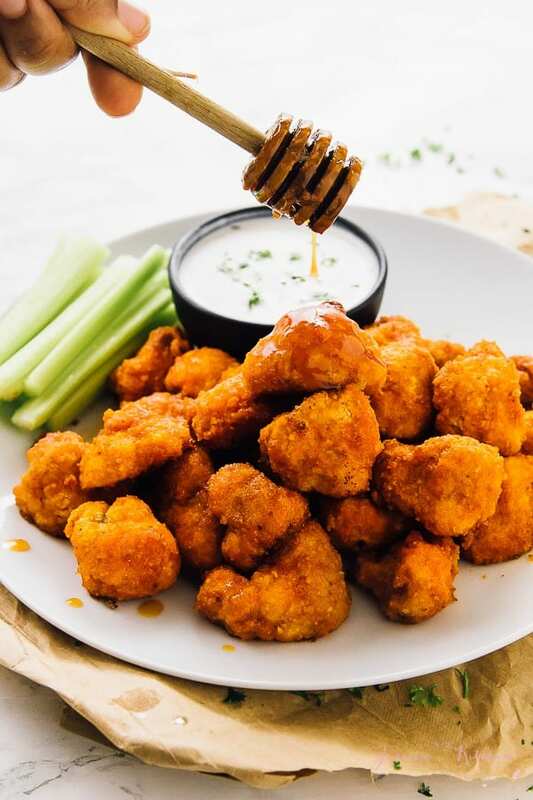 Cauliflower wings are my favourite though I am trying not to eat them too regularly :-)) because they ain’t really healthy with all the oil and coating for my sensitive stomach. Thanks so much Angie! Do you mean your cauliflower wings/do you fry them? No oil here in these 🙂 sometimes I use almond flour for the coating – much thinner and works just as great! Just gorgeous!! 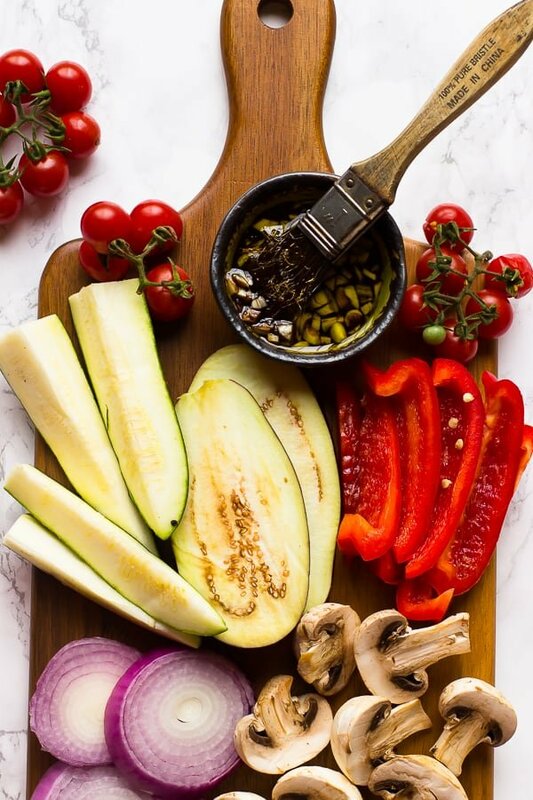 My mouth is watering over all of these veggie goodies! They are my FAVORITE! Seriously, my husband makes fun of me because I crave for veggies all the time. Love these awesome tips! Thanks so much Kelly!! Haha I totally can relate! Hi super excited to come across your site with fresh ideas.. Looking forward to trying them out. Thanks so much Ali and welcome to my site! I hope you enjoy my recipes!